Cinderella's horrid step-sisters have been portrayed in many ways over the years –ungainly, unattractive – but only designer Shona Reppe would have an imagination vivid enough to turn the siblings into a pair of satin gloves. 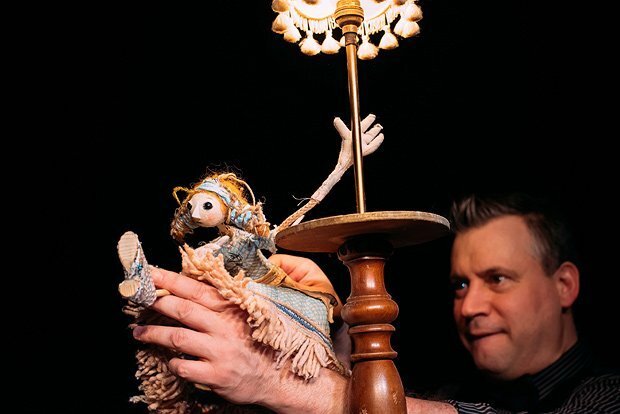 No longer delivering the show herself (equally proficient puppeteer Rick Conte is now at the helm), Reppe has a reputation for being one of Scotland's finest theatre-makers for young audiences, and Cinderella is a prime example. Her design for the show, a clever table with flaps and drawers to indicate the various quarters of Cinderella's home, keeps the action tightly confined to centre stage where the storytelling and characterisation can shine. Conte is gentle and kind when manipulating our heroine, sharp and mean when pulling on the satin gloves to depict the two sisters. And when the raggedy puppet is transformed into a ball gown-wearing party-goer, it's Conte himself who plays the fairy godmother, replete with bejewelled bowler hat and American accent. If you're looking for big and brash, loud and lively this Christmas, then keep walking. But if a subtle, charming, funny and clever are on your wish list, you know where to go. Traverse Theatre, Edinburgh, until Sun 24 Dec. Award-winning children's puppet show re-imagined by Shona Reppe and performed by acclaimed puppeteer Rick Conte.